winADAM is a data collection system including all hard - and software needed for measurement and data analysis. It is extremly robust. Military use and drives on race courses like Nürburgring wer done successfully. Measurement data are used to assess drive trains, driver behaviour, real time regulation of test rigs or specifications for vehicle simulations. 3 acceleration sensors in 3D directions (vertical, longitudinal, transverse). analogous-digital converter for 5 analogous channels with a voltage in between -10 und + 10 V. The channels are always logged no matter if other external channels exist. A CAN-Interface ist included and the collection of 20 CAN-Signals always happens. The configuration is got from a *.dbc file which has to be prepared by the customer. Yo can use winADAM for long-term measurements over several days or even weeks with a reduced sample rate. On the other hand you can do high dynamic measurements using high sample-rates. You can select the sample rates according to the following table. in the case CAN-data are collected the CAN plug must connected to the vehicle CAN-socket. Turning on the Computer the measurement program is started automatically. The vehicle should stand nearly horizontally because a calibration of the acceleration sensors happens. Oblique Standing while calibaration can be repared reprosepctively after the measurement. While measurement winADAM does not need any user activities. An acoustic signal each 10 seconds shows the correct function. Occuring faults are signaled by language edition in clear text (e.g. „no power supply“) so that you can monitor winADAM alone acoustically. While measurement user entries are possible e.g. to describe the environment or traffic regulations linked to the location of measurement. By this capabilities an extensive documentation of the measured route is got. 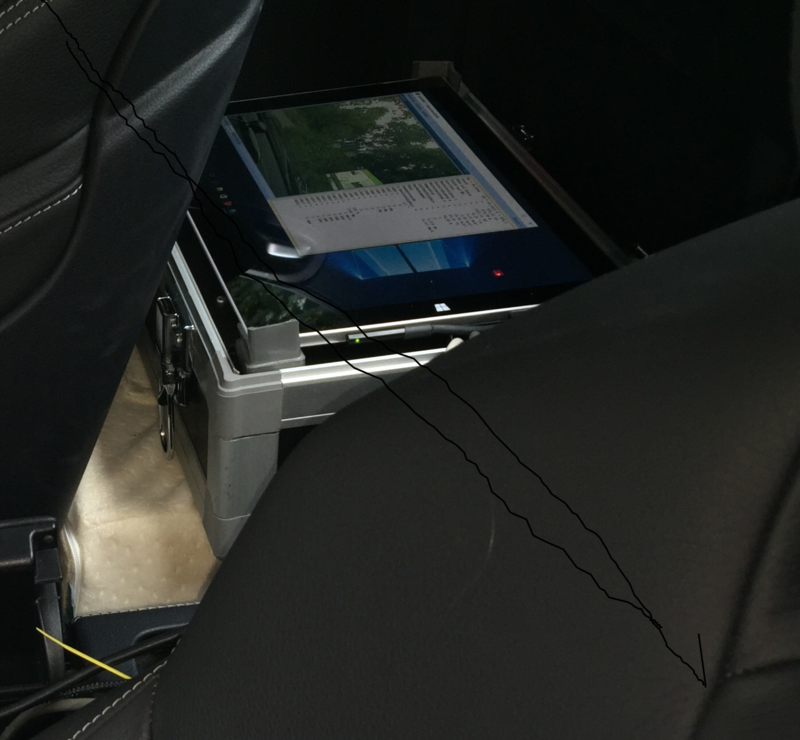 A real time GPS-tracking shows the driven course and gives a visual check of the plausibility of measurement. winADAM can work up to 4 hours by supply of the internal accumulators. For longer duration of measurements a plug in to the cigarette lighter is recommended. The sample rate for measurement can selected different for the channel Groups. GPS is sampled 1 time a second. Video sample rate can be up to 30 Pictures a second. In case of Long Duration measurements a samle rate of 1 Picture a second can selected resulting in a large space capacity for some weeks measurements. Sample rate of all analogous data is identic but can selected up to 200Hz per channel. CAN-data too can use up to 200 Hz. You can interactively modify the data. You can create share routes, which you can sort in different order. If you create a new route by combining different share routes an automatic adaption of length and time coordinate is created. The measured GPS-data are connected by splines. Using the video pictures a post processing enables you to add information like traffic densitiy, traffic lights, Speed Limits . 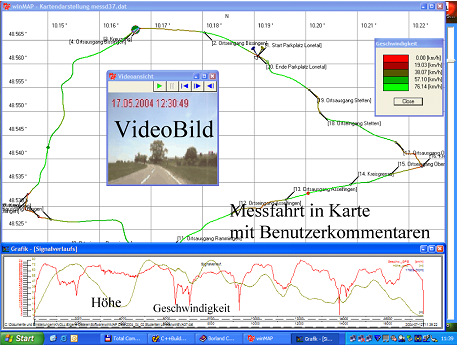 Willmerding, G.; Trübswasser, F.; Häckh, J.: A simulation system to predict fuel consumption and emissions considering the traffic flow. 5. Aachener Kolloquium Fahrzeug- und Motorentechnik 1995. Tagungsband. Willmerding G.: Vorhersage der Lebensdauer dynamisch belasteter Bauteile durch Kombination von Lebensdauerberechnung mit Finite Element Methode, Vortrag Nr. 14 auf der Tagung Fahrwerk-Tech 99 Adaptive Fahrwerksysteme, 4-5. März, München, Tagungsunterlagen TÜV-Akademie München. A DGPS-receiver with data correction via satellit is used: The sample rate is 10 Hz.